On 23 September, the Public Sector Bodies (Websites and Mobile Applications) Accessibility Regulations will come into force. They’re important because they state every public sector website and app must be accessible to all users, especially those with disabilities. Website owners will have to publish a statement saying whether they have met the accessibility requirements or not. It will also contain a feedback mechanism for users to say if something is not working for them. Part of our job is to work on these incoming regulations. We created some example accessibility statements to test with users to see if they were clearly understood and satisfied their needs. To do this, we ran 6 pop-up research sessions and 8 lab-based testing sessions, which gave us a good understanding of what information users need from an accessibility statement. We’ve personally not had a lot of experience researching with people who have access needs, so we looked around for guidance to help inform our approach and found GOV.UK service manual to be very helpful. We also asked the accessibility community lots of questions to ensure we were taking all the right steps. But ultimately, no matter how prepared we were, there were some things we could only learn through experience. We ran some pop-up sessions to provide quick insights to support our case for more in-depth research, following the guidance on conducting pop-up research on GOV.UK. We went to 2 locations in London - the Royal National Institute of Blind (RNIB) assistive technology shop in Kings Cross and the Mencap offices on Old Street. We asked users to read through the accessibility statements we’d prepared and provide feedback on what was useful to them. We soon learned how difficult running the sessions would be. Most users did not own or have their assistive technology with them, which made sessions with those who had visual impairments particularly challenging. We tried reading the accessibility statements to them, but quickly realised how uncomfortable this was for people, so decided to stop the research. It’s important to consider the characteristics and types of people that go to the location you’re researching at, as they might not be appropriate for the research. In this instance, people at the RNIB shop were at the beginning of their assistive technology relationship, and therefore did not have the necessary equipment to participate in the type of user research we were doing. For our more in-depth lab research, we decided to recruit users ourselves to avoid recruiting professional testers - which can sometimes happen when using third-party recruiters. We contacted charities, universities and disability networks, but found that some organisations were protective over their users. This made identifying and contacting people quite difficult and forced us to change our recruitment approach. We put an advert in the Disability Rights UK newsletter which proved to be a very successful approach as it was shared by lots of organisations we had not considered previously. When it came to our lab research, it was difficult for some of our visually impaired participants to bring their own assistive technology with them. Some users asked to use our laptops instead. Alistair Duggin, GDS’ Head of Accessibility, had advised us setting up screen readers involved a lot of personalisation, but our participants told us they were sure they could use the tech in our accessibility empathy lab. However when it came to testing, although they were using the same operating system and screenreader software as they used at home, small differences in setup caused problems for them. For example, users were manually having to check links - which can be very time consuming - instead of clicking through searchable links on a page. We are keen to remove the stress this causes in future sessions. This taught us assistive tech is personal and it’s important to make sure participants are using their own equipment when carrying out this type of research to get the best results and the smoothest journey. If they are not able to bring it with them, it’s worth going to visit them instead. In user research we often talk about developing empathy by seeing what our users go through. This is just as important in physical spaces as it is for services. Although we work in a modern accessible building, there were still challenges for our participants. These issues seem obvious now, but were not apparent to us until we saw how our participants experienced the challenges first hand. For instance, the bright lighting in the research lab made it hard for some users to see their screens. 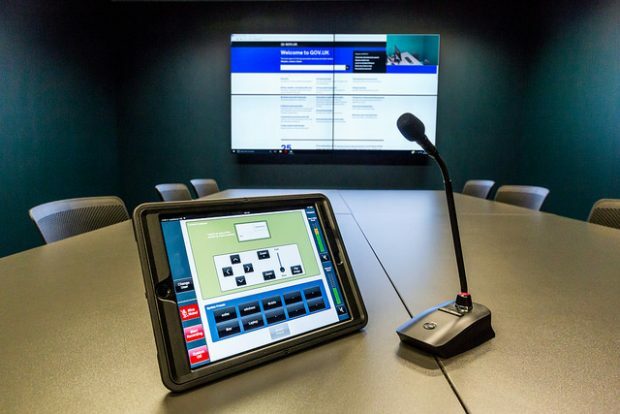 In the future, we’ll will think about how to make our environment easier for the visually impaired and we’ll talk to our user experience lab manager to help make improvements. Katie John and Leon Hubert are user researchers on the Accessibility team at the Government Digital Service. To find out more about the EU Directive and what you need to do, read the guidance on the new accessibility regulations for public sector websites and apps. 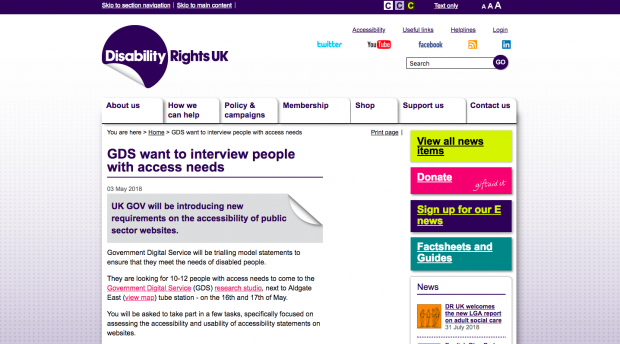 There is more information on the work we are doing on our Accessibility Blog.